The Gullah Geechee Cultural Heritage Corridor is a federally recognized National Heritage area managed by a Federal Commission. Commissioners work in partnership with the National Park Service and the state historic preservation offices of Florida, Georgia, North Carolina and South Carolina. Dr. Antoinette Jackson was appointed to the Gullah Geechee Cultural Heritage Corridor Commission in October 2007. Visit Gullah Geechee Cultural Heritage Corridor for more information. Gullah Geechee Cultural Heritage Corridor Commission Meeting–Awendaw, South Carolina June 6, 2014. 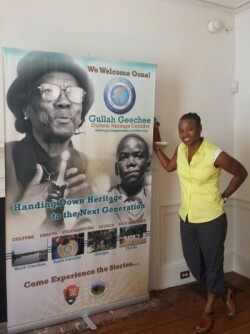 Antoinette Jackson represented Florida at the quarterly meeting of the Gullah Geechee Cultural Heritage Corridor Commission held in Awendaw, SC. Community residents in attendance shared concerns about proposed power line construction plans and implications for cultural heritage preservation in the Santee Delta region. The Commission hosts public comment sessions and encourages community engagement in cultural heritage education and preservation projects throughout the corridor.